These ‘secret’ bamboo fibre rich socks, a pure must for spring and summer’s warner temperatures, are HJ Hall Plain Shoe Liners, a style for men that will fit almost invisibly in low cut deck shoes, loafers, court shoes, espadrilles… in fact, all those footwear styles that you are tempted to go sockless in – well don’t! That’s a sure-fire route to stinky, sweaty feet, blisters and chafing. The true fit and comfort of these protective socks, which include inner heel grips and hand linked toes for smooth seams, will keep you on-trend without being on the hunt for plasters later on. 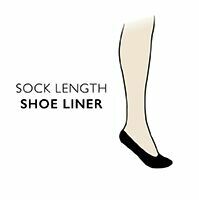 And because they’re made with bamboo fibre, HJ Hall Plain Shoe Liners are soft and silky, able keep your feet fresh, cool and healthy, due to its natural moisture handling and anti-bacterial properties.